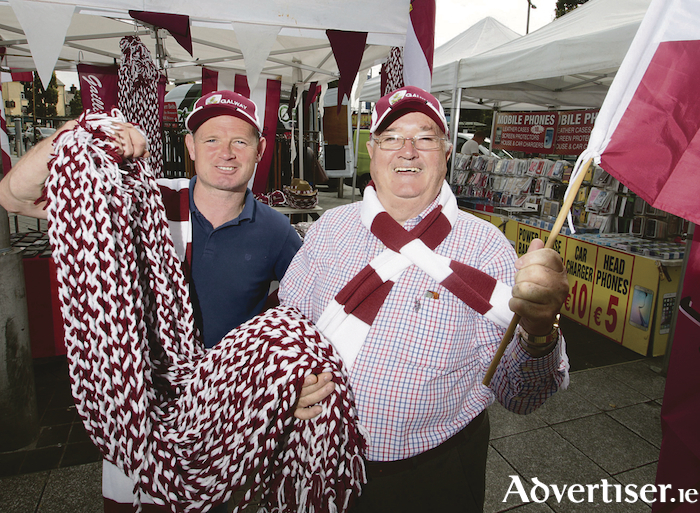 Hurling fever has taken hold of Galway as the county prepares to tackle Limerick in this Sunday's decider at Croke Park, when Micheál Donoghue's senior men travel to Dublin, looking to secure back-to-back titles for the first time since 1988. The hunt for elusive tickets for Sunday's mouthwatering All-Ireland senior decider has intensified in the last few days with fans clamouring to be at what many expect to be the most exciting hurling final in years. This year's All Ireland hurling showpiece has been brought forward to this Sunday to accommodate Pope Francis' visit to Ireland, but in spite of the earlier date fans' appetites remain unabated for the ultimate event of the hurling calendar. More than 25,000 Galway fans are heading to Croke Park on Sunday, and as many again are expected to travel to Dublin the hope of finding a last-minute ticket, so the next challenge for many supporters is securing transport to get to the capital. For those who will be staying in the city, the Galway City Business Association with the Galway City Council and local businesses have arranged for a big screen to be erected at the Meyrick Hotel end of Eyre Square on Sunday to cheer on both the minor and senior panels. Organisers have advised patrons to get to the square early in order to gain a good vantage point, and to obey the direction of stewards. Should Liam MacCarthy come back across the Shannon to the west for the second time in as many years, Cllr McNelis has revealed there will be a homecoming. For those lucky enough to be in Dublin on Sunday it is advised to bring a raincoat as Met Éireann predicts it to be wet and humid in the morning and early afternoon. A spokesperson says it will be “cloudy in the morning with some rain in the early afternoon. But it will dry out gradually as the afternoon progresses with some bright spells developing. Temperatures are expected to hit a high of 21 degrees Celsius”. Rain or sunshine, it will do little to dampen the spirits of Galway fans if their hurlers return across the Shannon with the prized Liam MacCarthy Cup.